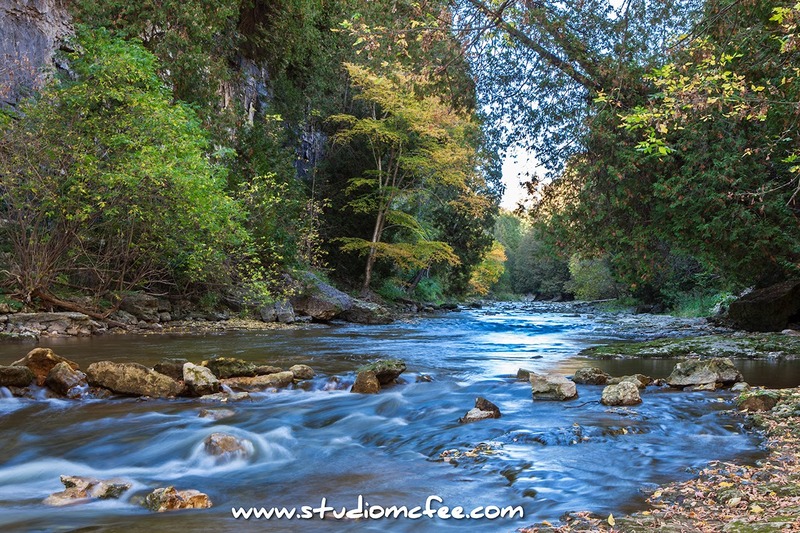 The river flows past limestone cliffs, cedars and poplars, winding its way over and around rocks and logs. Sunlight glistens on the water turned blue by the reflected sky. Bluejays proclaim the leaves are turning, winter is coming. Beware. Beware. On the wind, aromatic hints of dying leaves and wood smoke echo the bluejays' warnings. There is a crispness to the air. At the bottom of the gorge, looking upstream, there is no indication that a town is nearby. But this river, the Irvine, passes through Elora, Ontario joining the Grand River near the western edge of the town. For a few kilometres both rivers descend through a deep gorge (the Elora Gorge) cut in the limestone rock. The photo frames the Irvine River upstream from the David Street bridge. This beautiful, tranquil, location evokes a sense of pristine land, untouched by humans. And yet, a ten minute hike will bring you to the main street of Elora.